Music is something current generation cannot live without. It has been heard and admired since centuries. It is one of the lightest and most easily accessible forms of entertainment. If you are blessed with a good voice and really enjoy singing, building a home studio will be a dream come true for you. It is not as difficult as it seems. The thing is to stop planning and start working. 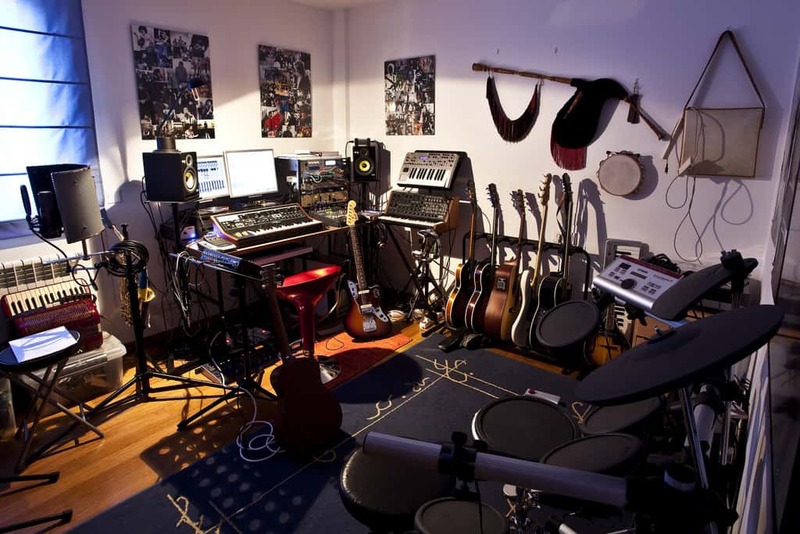 You can set up your own home recording studio with only a little investment. Sing your heart away and upload the videos on YouTube and Facebook. Who knows you end up being the next rock star. Also you can let others use your place to record music and earn some money. Here are some easy steps to build your personal recording studio in your home. Of course, to build a studio, first of all you need a place. You can choose a garage in your garden that is no more used for its original purpose. Or if you don’t have that, you can even convert your own room into a studio. It might just be a little difficult to completely sound proof a room but of course not impossible. Sound proofing of the place you have chosen to set your studio is next important step. Make sure no noise can enter or escape the room. Sealing strips are available in DIY stores that will help you seal doors and windows. The sealing process also blocks the air but you don’t want to die of suffocation of course, so set up and inlet and outlet to allow constant passage of air. Also you want some light too to work in your studio. For this purpose, replace the ordinary glass with a sound proof glass. Since you already have a computer, you don’t need to buy a new one. The recommended specifications are 4 GB RAM and some free gigabytes of memory. To test if your computer is serving the purpose, install a DAW and try recording. It is a software you need to start recording. It allows you to record, listen, process and edit the audio. There are multiple digital audio workstation programs available on Google. Any good DAW will work. A good option for electronic producers is Ableton while non-electronic producers should go for Logic Pro X. the other good options are Frooty Loops, Studio One, Cubase, Bitwig and reason. Most of these are paid so you have to buy them. If you want to go for a free software, choose garageband. To be a good singer, you first need to clearly hear what you sound like. Buying good speakers and headphones is not a bad investment at all. They are essential to produce good music because if you cannot hear the flaws, you most definitely cannot correct them. For a home studio, you don’t need to buy an exceptionally expensive microphone. Its good qualities can cause you problems like it is highly likely to pick up your home studio ambience that you wouldn’t want. So a reasonable microphone that serves your purpose will work. Shure SM 75 is a very good option for home studios. It is even used in professional studios and concerts. The last thing you need to complete your home studio is an interface. To connect your monitor, headphone and microphone together you are going to need an audio interface. You can easily find one that suits your budget. Now that you have set up everything, connect everything together and start recording!